Straight forward styling make this fireplace of universal appeal. Ideal for both contemporary, and traditional settings. Shown with, Stoven™ Mayfair SE wood burning stove and Stone pattern design to Vermiculite chamber. The Tagus fireplace incorporates a honed black granite hearth, however we can supply with a matching stone hearth if so desired. The Stoven™ Mayfair SE wood burning stove shown is unique, as this all new patented design stove incorporates the following features: Separate very large panoramic curved glass panel and door, so you can enjoy watching the fire burn with maximum effect. An integral oven built into the lower part of the stove with separate door, enabling cooking, ideal for cosy nights in around the fire, also a great back up for cooking in emergency situations, if there is mains supply failure. Air wash system to glass. Attractive design. 78.8% efficiency. Clean burn technology. CE approved. Smoke exempt approved, to allow burning in smoke controlled areas. 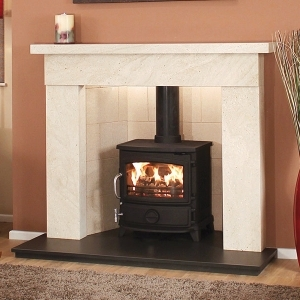 The Stoven™ Mayfair SE is shown with short legs which are an optional extra if there are any height restraints for stove installation. The Vermiculite Stone patterned chamber is also available in the following designs, Herringbone brick design, Reeded design and Brick Bond design. There is the option to select any of these designs enabling you to mix and match to your choice. Also available in Fine Natural Medistone.